This page features news items from 2007. Some of the information included here may now be out-of-date. Ant and Joji Hirota's new album Wildlife will be released by Disk Union in Japan on 21st December. The album is a selection of highlights from the music that Ant and Joji have collaborated on for various television programmes in the award-winning Survival series alongside Ant's score for the BBC Natural World programme Midway: Island of Life. More information about Wildlife, including the full track listing can be found here. The album is being included in the fifth and final batch of the re-issues of Ant's albums in Japan - we've updated our summary page about the Japanese re-issues to reflect this. Wildlife is being released initially in Japan but will be released elsewhere in due course. Visitors to the site will no doubt be aware that the long-awaited re-issues of The Geese & The Ghost, Wise After The Event and 1984 have not yet been released outside Japan. At the current time it looks likely that they will now be released in other territories in the Spring of 2008 - as soon as we have definite information about this then we will of course post it here. Following on from the news about the new cover designs for the three Missing Links albums, we can confirm that the re-issue of Archive Collection Volume One that is being released by Disk Union in Japan will also feature new artwork. The new artwork is a Peter Cross painting called 'The Field of the Cloth of Gold'. The musical content of the re-issue remains the same as the original release of the albums - no extra tracks have been added to it. The album will be released as a two disc set as per the original 1998 release. Update: The re-issue of Sail The World that is being released by Disk Union also features a new cover design based on more of Ant's original photographs. The new re-issues of the three Missing Links albums (Finger Painting, The Sky Road and Time & Tide) which are being released in Japan by Disk Union will all feature new cover designs. The new covers are based on Ant's original photographs. The musical content of the re-issues remains the same as the original releases of the albums - no extra tracks have been added to any of them. Ant is currently working on a new Library music project for Atmosphere Music. As with the majority of his Library music, this won't be available commercially. We have now received information on the fifth planned batch of the re-issues of Ant's back catalogue which are planned for release on 21st December. The albums in this batch will include Sail The World, Slow Dance, Archive Collection Volume 1, Archive Collection Volume 2 and Field Day. This information has been added to our summary page about the Japanese re-issues. 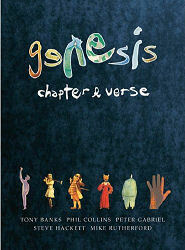 Out now is Chapter & Verse, the official biography of Genesis which based on interviews that the current and former members of the band have given to writer Colin Dodd. Ant has been interviewed for the book which also contains a wealth of photos including many that have not previously been published. From the publicity information: This book is the first time in over 20 years that Tony Banks, Phil Collins, Peter Gabriel and Mike Rutherford have collaborated creatively on a project, working together to create the complete history of Genesis. It is a story that spans 30 years and 30 albums selling a staggering 212 million copies worldwide. It embraces world tours that have played to 25 million people and it covers the high-profile departure over the years of one vocalist, (Peter Gabriel), one highly influential guitarist (Steve Hackett) and their best-known drummer and vocalist (Phil Collins). Anthony Phillips (guitarist, founder member to 1970), Tony Smith (manager since 1973), drummers Bill Bruford, Chris Stewart and John Silver, and Ray Wilson, the Genesis vocalist after Phil Collins. Chapter & Verse is available to order from Amazon. A planned audiobook CD release of Chapter and Verse is due out next summer. An update to the previous news item on the re-releases of Ant's back catalogue - the release date for the fourth batch of albums (including the three albums in the Missing Links series) has now been revised to 23rd November. This updated information has been added to our summary page about the Japanese re-issues. The third batch of albums from Ant's back catalogue will consist of volumes 6 - 10 in the Private Parts & Pieces series (Ivory Moon, Slow Waves Soft Stars, New England, Dragonfly Dreams and Soir�e) - with a planned release date of 21st September. As before, the albums are being released in the mini-vinyl format and are also being released in a limited edition boxed set. The fourth batch of albums are scheduled for release on 26th October and will include the three albums in the Missing Links series (Finger Painting, The Sky Road and Time & Tide). During a recent check on Ant's back catalogue titles for their re-release in Japan by Disk Union, we felt that the second album in the Private Parts & Pieces series Back To The Pavilion would benefit from being re-mastered from scratch. The only available set of master tapes for the album were those used for the 1990 Virgin CD release (which in turn was subsequently re-released by Voiceprint in 1996) so the only other alternative for re-mastering the album was to re-assemble it from scratch from all the original tapes used to compile the album for it's original release back in 1980. This turned out to be a lengthy and time-consuming process but the combination of the original audio sources together with Simon Heyworth's expert re-mastering has resulted in improved sound quality throughout. No extra tracks have been added to the album other than the recording of Lucy: An Illusion which was added as an extra track when the album was re-mastered for the first time in 1990. The re-mastered version of Back To The Pavilion will be released initially as part of the Japanese re-issues of Ant's back catalogue but will be released elsewhere in due course. We're pleased to announce the track listings of the extra CDs and other information about the re-issues of The Geese & The Ghost, Wise After The Event and 1984. All of the details are included on a special page here. Following the news about the second planned batch of the Japanese re-issues, we now have the details of the third batch of albums that are planned for re-issue. The third batch is planned to consist of the second five Private Parts & Pieces albums - Ivory Moon, Slow Waves Soft Stars, New England, Dragonfly Dreams and Soir�e - with a planned release date of 21st September. This new information has been added to our summary page about the Japanese re-issues. Information has now reached us about the second planned batch of the Japanese re-issues of Ant's back catalogue. The second batch of albums due to be released are the first five Private Parts & Pieces albums - Private Parts & Pieces, Back To The Pavilion, Antiques, A Catch At The Tables and Twelve - with a planned release date of 24th August. As with the five albums in the first batch of re-issues, the second batch are also being made available in a limited edition box set. We've also added a new page with a summary of all the information about the Japanese re-issues which can be found here. The Japanese record company Disk Union have recently acquired the rights to most of Ant's back catalogue for Japan and will be re-issuing most of Ant's albums in the mini vinyl card sleeve format as limited edition releases. The initial batch of releases are scheduled for release in Japan on 20th July on Disk Union's Arcangelo label and comprise the newly re-mastered 2 CD editions of The Geese & The Ghost, Wise After The Event and 1984 along with the previously released single CD editions of Sides and Invisible Men. The five albums are also being made available in a limited edition box set. The other albums that Disk Union will be releasing over the next few months are Private Parts & Pieces, Back To The Pavilion, Antiques, A Catch At The Tables, Twelve, Ivory Moon, Slow Waves Soft Stars, Finger Painting, Slow Dance, New England, Sail The World, The Sky Road, Dragonfly Dreams, Soiree, Time & Tide, Archive Collection Volume One, Archive Collection Volume Two and Field Day. Ant's collaborative releases with Harry Williamson and Guillermo Cazenave are not amongst the albums that are being re-issued. The newly re-mastered editions of The Geese & The Ghost, Wise After The Event and 1984 will still be receiving a UK/European release in due course. We are pleased to announce that with the kind permission of both Phil Collins and Mike Rutherford the extra CD that will accompany the re-issue of The Geese & The Ghost will include the 1973 recording of Silver Song with Phil on lead vocals. Recorded as a potential single by Ant, Mike and Phil at Island Studios in November 1973 (during a brief pause in the busy Genesis touring schedule to promote Selling England By The Pound), the track was ultimately never released for reasons that remain unknown. Now at long last the track is to receive an official release. The 1973 recording of Silver Song is the final track on the extra CD that will accompany the re-issue of The Geese & The Ghost. The track-listing for the rest of the CD will be announced in due course. One potential idea for the re-issue of Wise After The Event was to change the album to the originally planned running order (more details here), which included the original link pieces that were ultimately left off the album and were not heard until Ant included them on Back To The Pavilion in 1980. After much thought and having gathered opinions from a number of fans we have decided not to change the running order of the album so the re-issue will retain the running order of the album as released. The work to compile the re-issues of The Geese & The Ghost, Wise After The Event and 1984 is now at long last complete, with all the audio re-mastering complete and sleeve-notes written. The next stage is for the artwork for each of the albums to be put together. As previously announced, the release dates for the albums have not yet been set and this currently remains the case. As soon as they are confirmed then they will be announced here together with the track listings for the extra CDs that accompany each album. The Sixty Minutes With... is a series of sampler releases by many Voiceprint artists designed as an introduction to the artists work and as the title suggests is an hour of highlights from their Voiceprint releases. 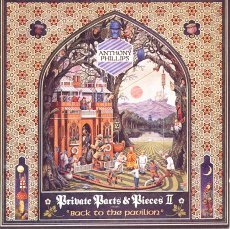 A release in this series featuring a selection of tracks from Ant's back catalogue entitled (not surprisingly) Sixty Minutes With Anthony Phillips was planned (which some visitors may have seen listed by on-line retailers such as Amazon) but this release is now not going ahead. The work to complete the re-issues of The Geese & The Ghost, Wise After The Event and 1984 continues in between other projects. After some consideration, rather than rush the work on the albums we've elected instead to spend a little extra time on them to ensure the best possible re-mastering of the audio and the presentation of the albums. In turn this means that the albums will not be released in the originally mooted slot in the Spring - instead a release a little later in the year is now planned. At the present time, the release dates for the albums have not been set but once these are confirmed by Voiceprint then we will of course announce them here, together with the full track listings for the extra CDs which will accompany each of the albums. On a related note and in response to a few enquiries received on the subject of the rest of Ant's back catalogue, there are currently no plans to re-issue any of Ant's other albums. Ant continues to work on his next Library music project for Atmosphere Music. As with the majority of his Library music, this won't be available commercially. The re-mastering of The Geese & The Ghost, Wise After The Event and 1984 is nearly complete and we are currently putting together the material for the new booklets which will accompany each of the CDs.